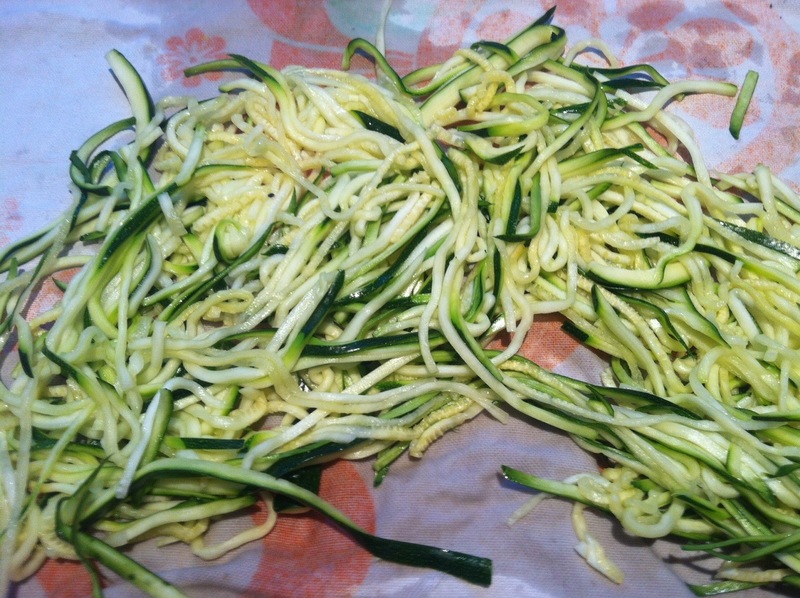 First you have to shred/Julienne the zucchini. This recipe used 2 large ones. I use my mandolin – it’s one of the best little kitchen gadgets! Place the zucchini in a colander in the sink and salt it – reasonably generously. This helps the zucchini stay together when cooked and not turn to mush. After about 30 mins rinse it fairly well (otherwise it’s a bit too salty). Drain like this on a teatowel, you can also roll it up in the teatowel to absorb most of the moisture. Then you dry fry the zucchini for a few mins to again reduce more of that moisture. I then added a bit of oil (my favs are macadamia or coconut oil), and tossed it around for another couple of mins. 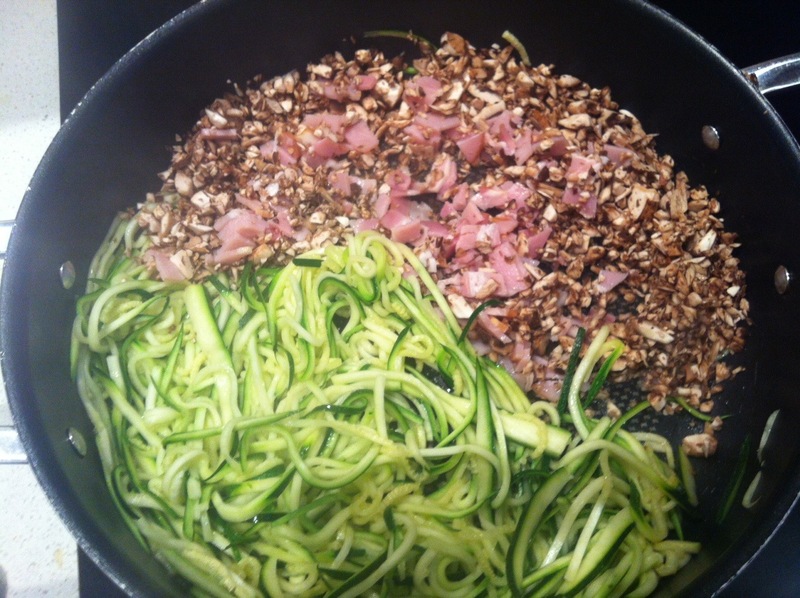 Push the zucchini to one side of the pan. Throw in a couple of handfuls of diced mushrooms and a rasher or 2 of diced bacon. Add a bit more oil to cook the mushroom and bacon. After the mushroom and bacon have cooked a bit, you can start mixing it all together. 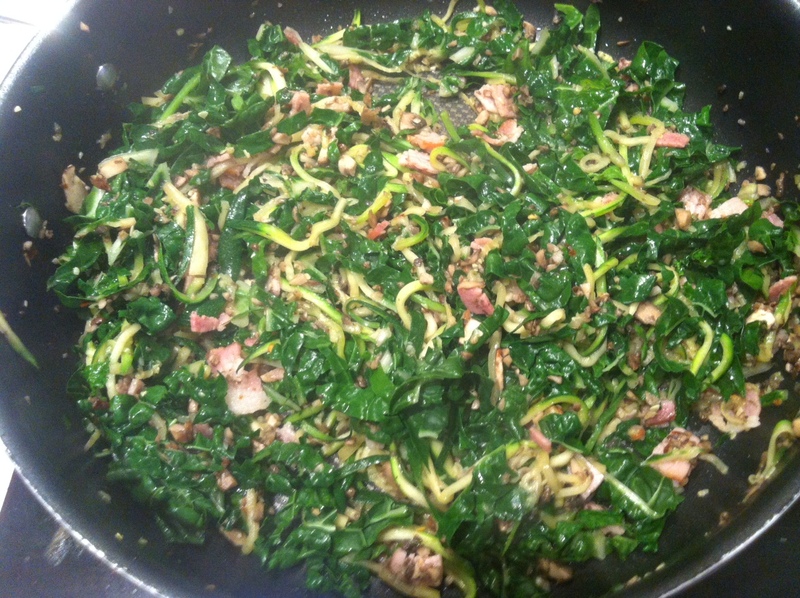 Then add a few good handfuls of shredded silverbeet (about 3-4 large leaves, stems removed) and stir for a minute or 2. Season with pepper and chilli flakes – you really shouldn’t need more salt as the zucchini and bacon are already quite salty. Serve with your favourite pasta sauce on top or as a side with your favourite protein.